Can Exposure to Aflatoxin Cause Gallbladder Cancer? Exposure to aflatoxin increases risk of gallbladder cancer, researchers report in the September issue of Gastroenterology. Ingestion of aflatoxin, produced by a fungi that grows on corn and peanuts, could account for the high incidence of gallbladder cancers in some regions of China and Chile. 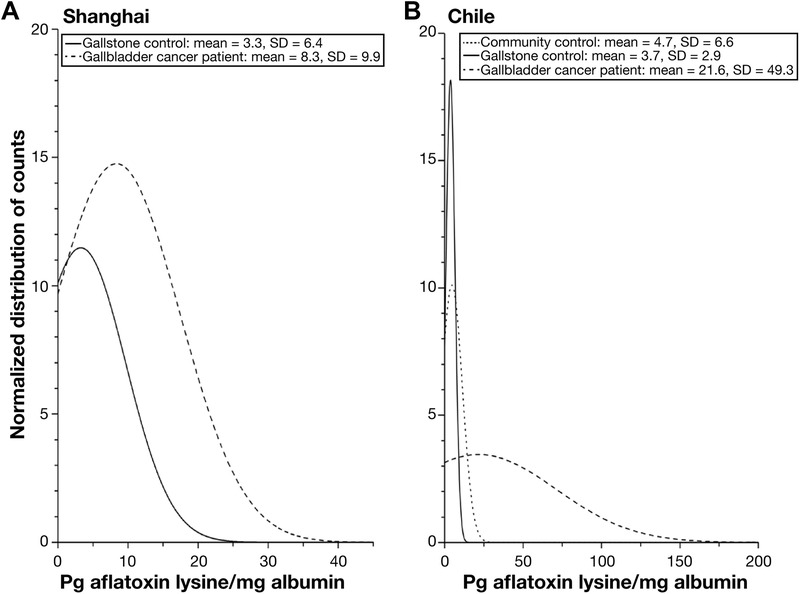 Normalized distribution of detectable (≥0.5 pg aflatoxin–lysine/mg albumin) aflatoxin B1-lysine adduct levels in the (A) Shanghai Biliary Tract Cancer case-control study and the (B) previously published gallbladder cancer study in Chile. Gallbladder cancer, the most common biliary tract cancer, has a high rate of mortality; patients have a median survival time of approximately 6 months. The incidence of gallbladder cancer varies with region, and is highest in south-central Chile and northern India. Gallstones are the best known risk factor for gallbladder cancer, but little is known about other preventable risk factors. Aflatoxin, a family of toxins produced by fungi found on maize (corn), peanuts, cottonseed, and tree nuts, increases risk of liver cancer, possibly by increasing cell proliferation in the biliary tract. The excretion of aflatoxin into bile can lead to high concentrations in the biliary tree, and aflatoxin exposure has been associated with gallbladder carcinogenesis in primates. Jill Koshiol et al examined the association between aflatoxin exposure and gallbladder cancer in a study of 250 patients with and 250 patients with gallstones without cancer (controls) in Shanghai, China. They measured aflatoxin B1 (AFB1)–lysine adducts in plasma samples. These adducts accumulate in plasma of individuals dietary aflatoxin exposure and serve as markers aflatoxin exposure over the previous 2 to 3 months. The AFB1–lysine adduct was detected in plasma samples from 67 (32%) of 209 patients with gallbladder cancer and 37 (15%) of the 250 controls. The median plasma level of AFB1–lysine was 5.4 pg/mg in individuals with gallbladder cancer, compared with 1.2 pg/mg in controls (see figure). For patients in the fourth quartile of AFB1–lysine level vs the first quartile, the odds ratio for gallbladder cancer was 7.61. Koshiol et al calculated the population-attributable fraction for cancer related to aflatoxin to be 20%. The R249S mutation in P53 has been associated with aflatoxin-related hepatocellular cancer. However, Koshiol et found none of the 54 gallbladder tumors sequenced to have this mutation in the TP53 gene, indicating that this mutation is not a mechanism of aflatoxin-related carcinogenesis in the gallbladder. However, the mechanism by which the R249S mutation in p53 could cause liver cancer is unclear. The authors state that there is evidence that the R249S mutation cannot induce liver carcinogenesis without other risk factors, such as the hepatitis B virus HBx protein. Koshiol et al conclude that patients with gallbladder cancer are 3-fold more likely to have detectable levels of AFB1–lysine adducts than gallstone-patient controls, and the risk increases with increasing AFB1–lysine adduct levels. This finding, from a region with low to moderate rates of gallbladder, supports findings from Chile, a high-risk area for gallbaldder cancer. Aflatoxin exposure can therefore contribute to this disease in low- and high-risk regions. Aflatoxin abatement programs could reduce the burden of this cancer in high-risk areas—this has already been observed for hepatocellular carcinoma. Gallbladder and biliary tract cancer mortality in China decreased by 22.5% from 1990 to 2013, in parallel with installation of aflatoxin abatement programs to prevent liver cancer. Does Asthma Increase Risk for Inflammatory Bowel Diseases?